(more info in spreadsheet). I’ll be updating the sheet with new planes as they are released. My reason for creating this goes beyond my OCD nature, but simply because I have yet to find any list (even Sp0nz's plans index) that includes every FT Plane ever released conveniently listed for you. Enjoy! Actual file is unable to be attached by the forums. 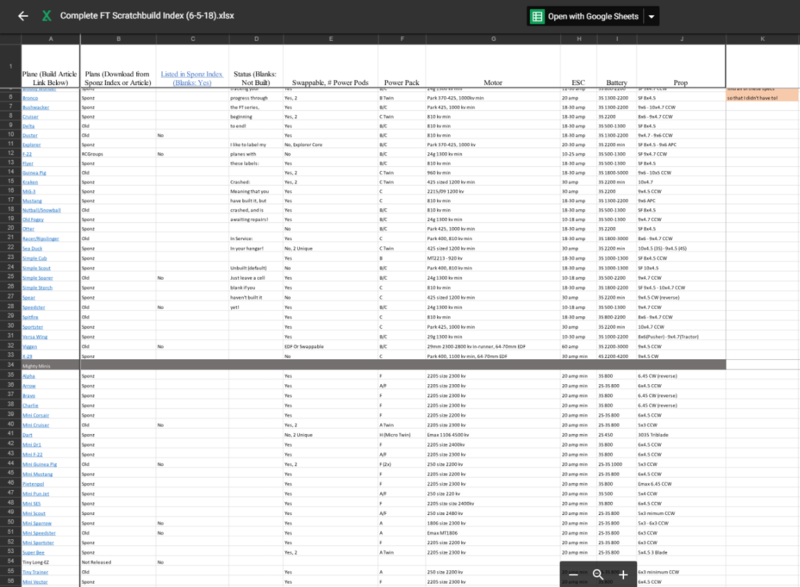 I recommend creating a copy of the sheet through google drive and editing it to your personal liking, or if you have excel, download a copy from google to edit with excel. I always take time to read any recommendations other people have. Make sure to let me know what you think by commenting below! 10/26/18 - Added FT Sea Angel and Long EZ. 8/29/18 - Added FT Goblin (mini-sized). 7/31/18 - Added Fowl Flyer, Edge 540, but Legacy (Founders') isn't available yet. 7/7/18 - Aware of Fowl Flyer, Edge 540, and Legacy (Founders'), will update in August when I return from vacation. 6/5/18 - Added links to the build article for each plane, just click on the name of the plane. Changed FT Sparrow Swappable status to "No". 6/4/18 - I’ve updated the Index with 20 amp ESC’s recommended for Mighty Mini’s, and corrections to the recommended motor for them. Great effort for someone who only has 3 posts here. Nice to collaborate with someone to do something like this. Thanks to Wayne as well for gathering the spec's for you. I would have thought with all the videos I watched that there were more then 39 p[lanes. I was under the impression of 60+ haha. Must be all the quad build videos as well as the prebuilts reviews. I guess the picture I posted is kind of misleading. It only shows 37 of the 54 FliteTest releases so far as of 6/4/18. More mighty mini models are cut out of the picture than I had hoped. Awesome work! I will definitely be using this! Ahh so I am NOT going deeper into my insanity. TY for the confirmation. Bump for newest update: Sea Angel and Long EZ!